The Federal Government on Thursday applauded the efforts of both Aliko Dangote Foundation and Bill & Melinda Gates Foundation for the eradication of Polio in the country. Describing the gallant efforts of the two foundations as rare, the Minister for Health. Prof. Issac Adewole expressed satisfaction that the country is now free of Polio, courtesy of the interventions of the two foundations and assured that the Federal Government will do all within her powers to ensure that the country remains polio free for ever. ending undernutrition in Nigeria. This commitment is expected to improve the lives of at least five million families by 2020. The new commitment was announced by Aliko Dangote and Bill Gates during a joint press conference in Abuja, Nigeria. Despite rapid economic growth, Nigeria is home to the highest number of stunted children in Africa and the second highest globally. Almost one in five Nigerian children is acutely malnourished and more than one in three children suffer from stunting. With its vital role in child health, growth and cognitive development, better nutrition will be essential to unleashing the potential of Nigeria’s next generation. “Nutrition is one of the highest impact investments we can make in Nigeria’s future growth and prosperity. We know that well-nourished children are more likely to grow up to be healthy, fend off preventable diseases, achieve more in school and even earn higher income as adults,” said Bill Gates. In a joint statement, the two foundations said they will begin a joint planning process to determine the details of the partnership. Programmes will include community-based approaches and proven interventions linked to behaviour change, fortification of staple foods with essential micronutrients, the community management of acute malnutrition and investments in the local production of nutritious foods. A key objective will be improving the livelihoods of households by supporting nutrition-sensitive agricultural programs that can increase family income, improve diets and empower women and youth. The two foundations also welcomed the increased political attention to undernutrition in Nigeria and noted that leadership will be critical to future progress. “In the spirit of our new partnership, we encourage even more deliberate and significant commitments from the Government of Nigeria at all levels to step up investments in nutrition. It is time to make strategic investments in interventions to eliminate malnutrition in Nigeria. “This will be achieved through a massive scale-up of interventions, matched with effective coordination of efforts and innovative sustainable solutions. 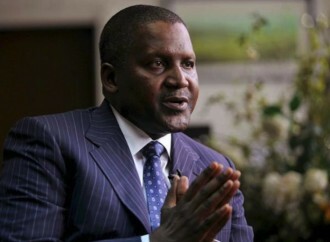 We have to ensure that children who are already malnourished receive help and are prevented from dying while we improve the conditions that led to them being malnourished in the first place’,” said Aliko Dangote.